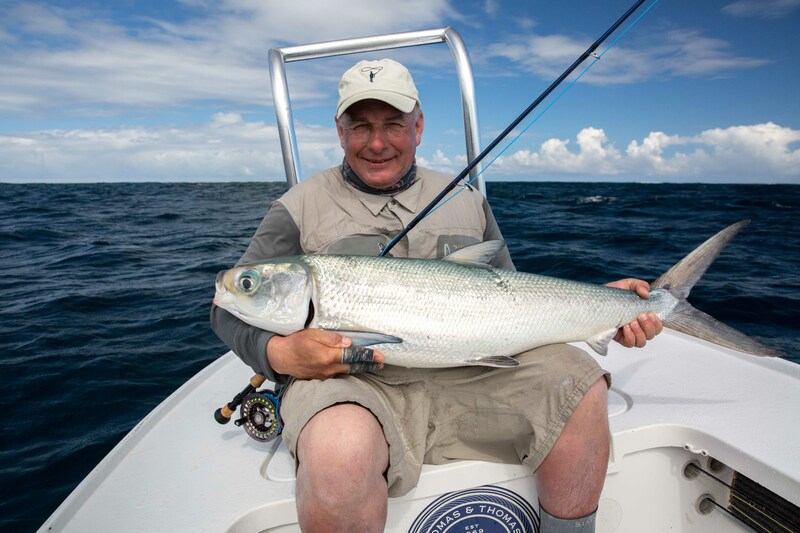 The most GT’s caught by any angler throughout the week. 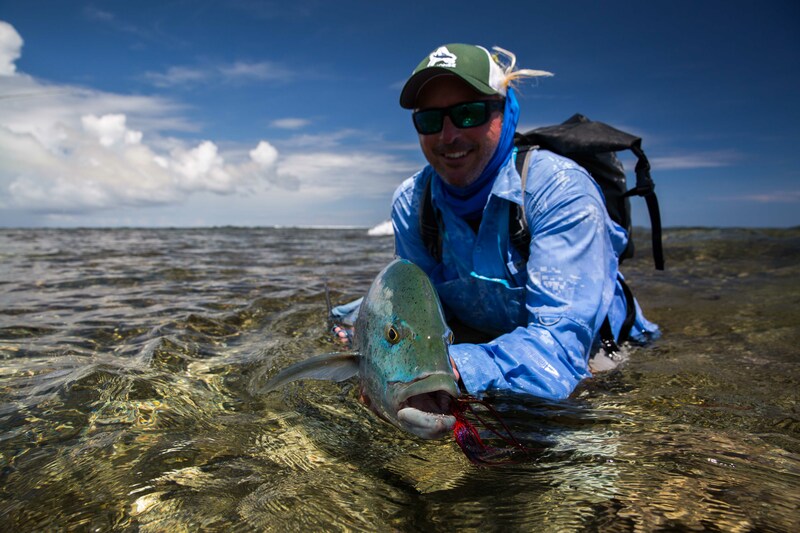 The winner of each category walked away with one of the fantastic main prizes generously provided by Thomas and Thomas Fly Rods, Cortland Fly Lines, Shilton Reels, Yeti Coolers, Flyz Inc. and Columbia Sportswear. 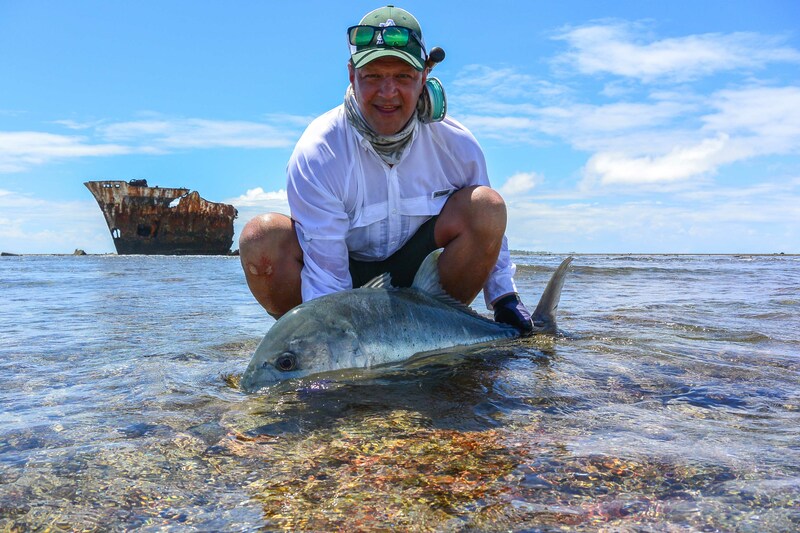 This year Lemmer Britz and Chris De Bruyn were the two lucky people to win an in-store draw for a trip to Alphonse Island to join the competition on behalf of Columbia Sportswear and Alphonse Fishing Co. 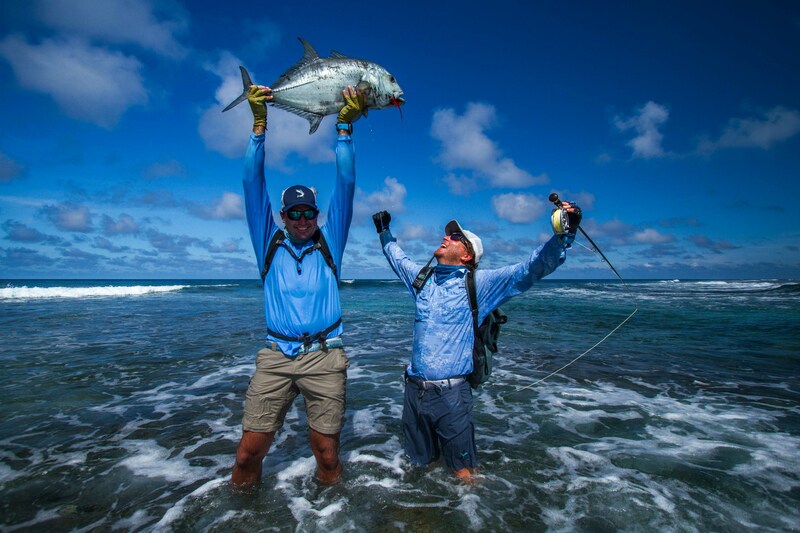 This all sounds very serious, but at the end of the day it’s about comradery and fantastic fly fishing. 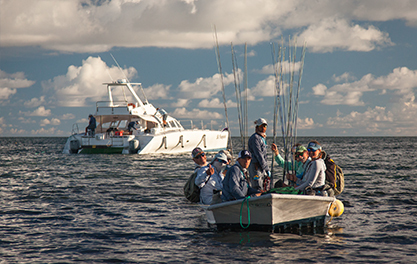 The tune was set and although there were evening festivities the teams where ready to fish hard. 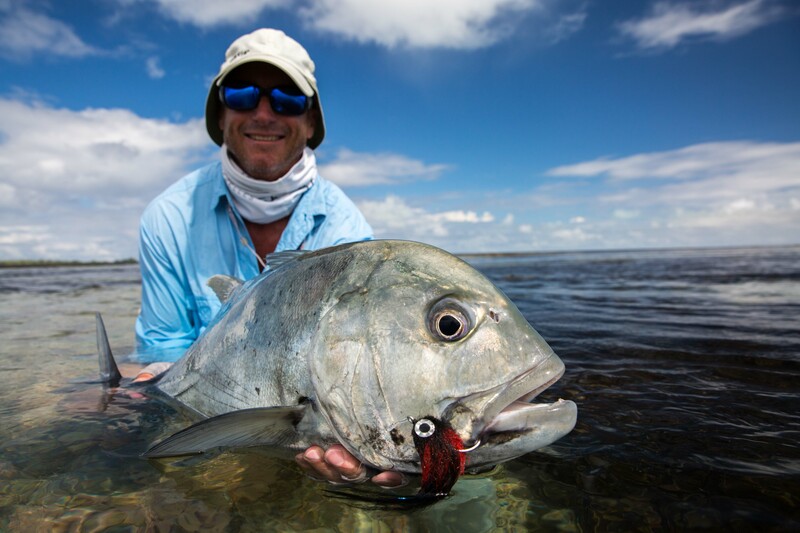 The start of the week had slow moving neap tides, perfect for the inside of the lagoon and the finger flats. 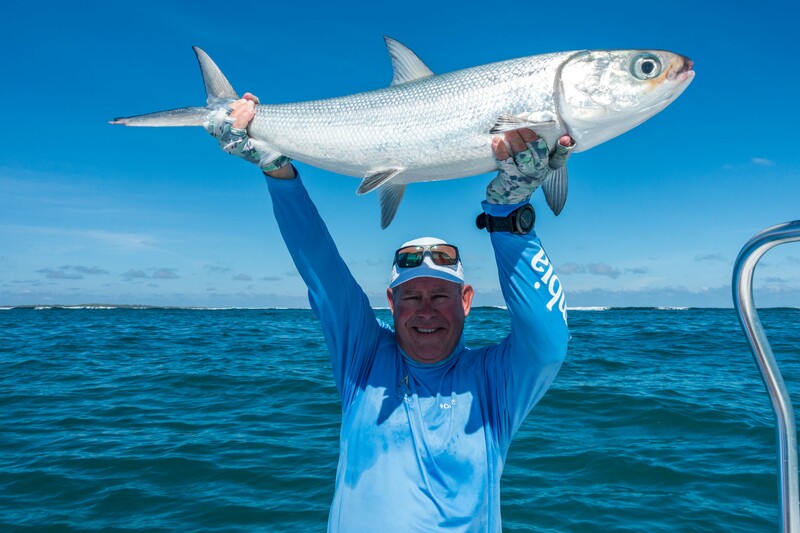 The competition couldn’t have started any better as Andrew Church hooked a monstrous GT on his first cast within the first five minutes of the first day. 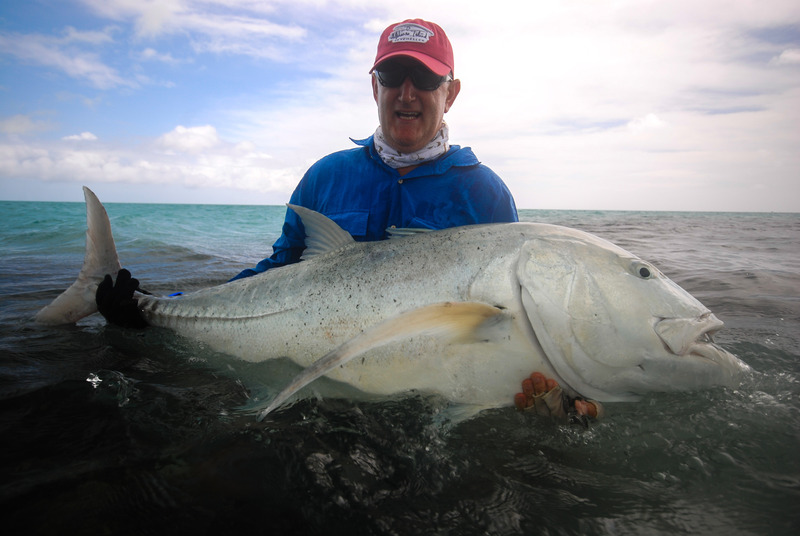 The fight lasted some time, but finally, Andrew subdued a magnificent GT measuring 124cm. 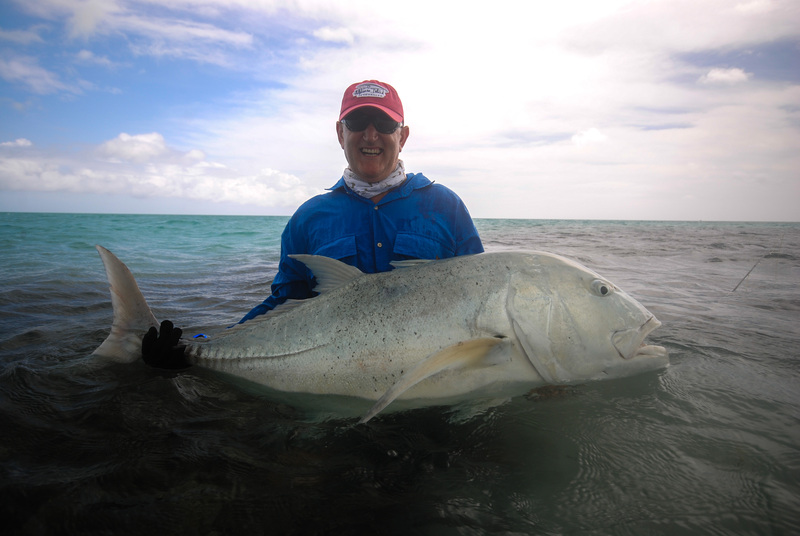 This became the target for everyone but ultimately it was a fish that was unbeatable and won him the prize for biggest GT of the week. 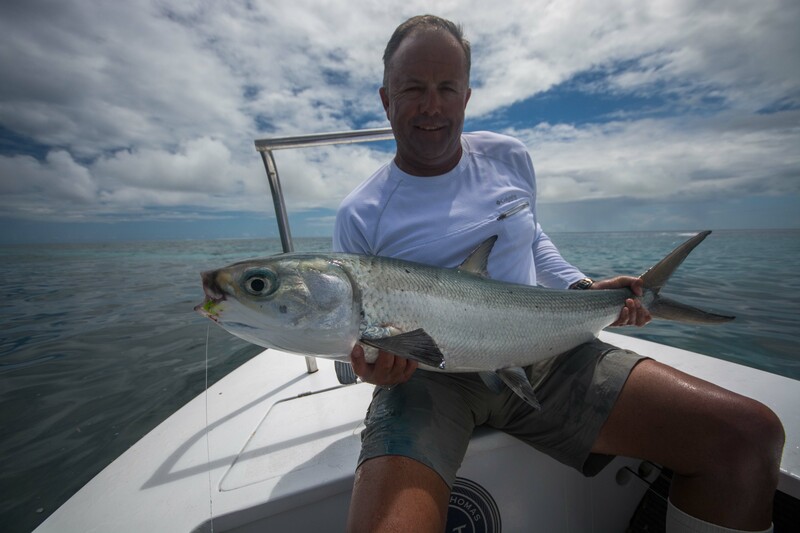 The GT’s were around in good numbers and particularly in the surf during the last couple of days with a total of 13 landed for the week. 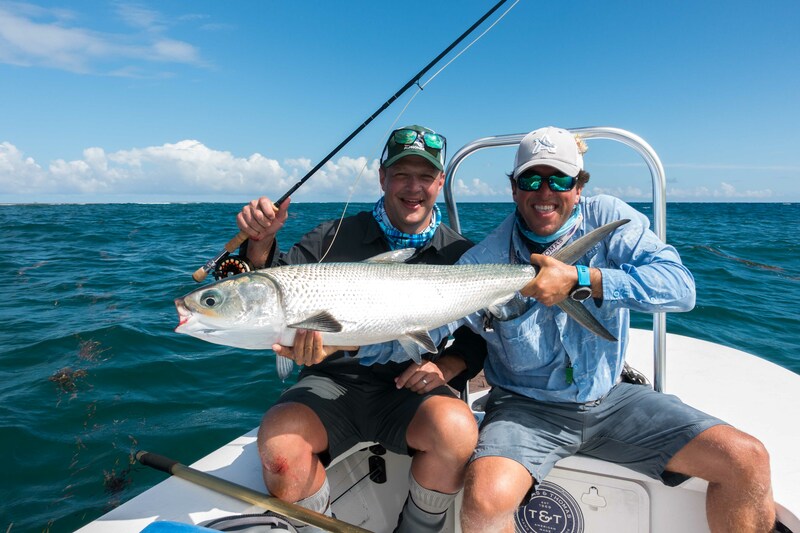 Ryan Wienand, Murray Collins, Ross Elliot, Keith Rose-Innes, Bob Skinstad and Justin Kemp all joined in the success. 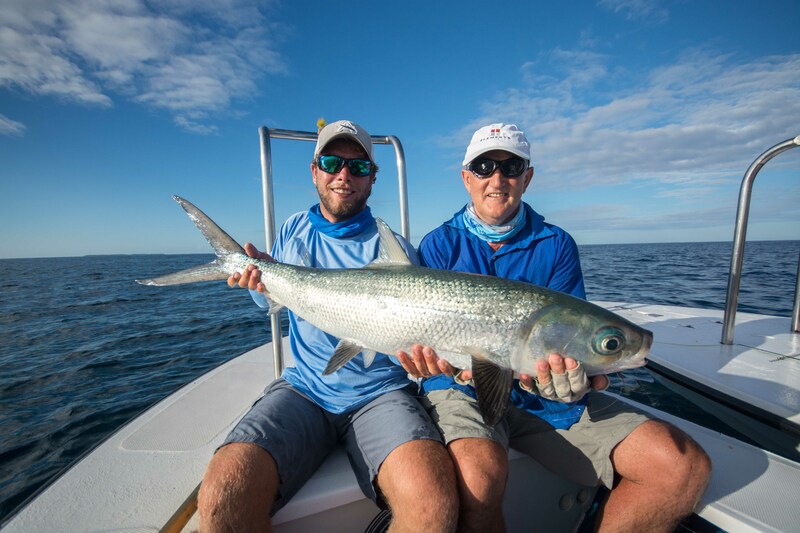 The GT numbers leader board was a tight race with Bob landing two fish of 87cm and 96cm when Justin finally clinched it on the last day by landing four fish in the surf taking his total for the week to five with the largest stretching the tape to 96cm. 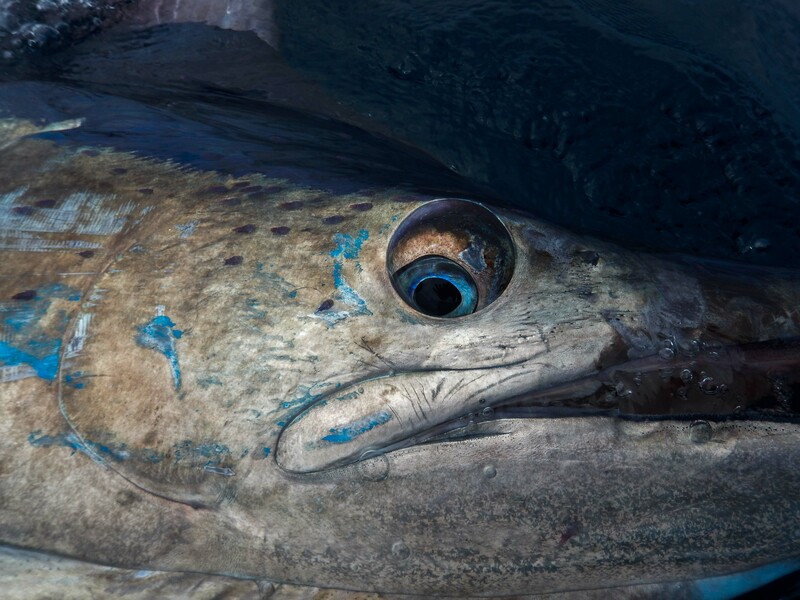 Over the full moon cycle, there was an incredible bloom of zooplankton matched with ice-cold water that triggered an almighty Milkfish feed. 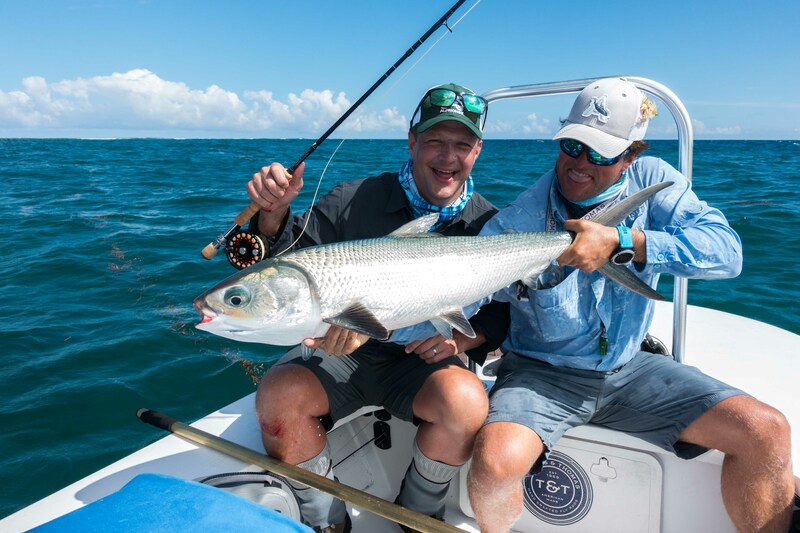 It was the perfect time for everyone to target these powerful fighters with an incredible result of 87 hooked and 23 landed. 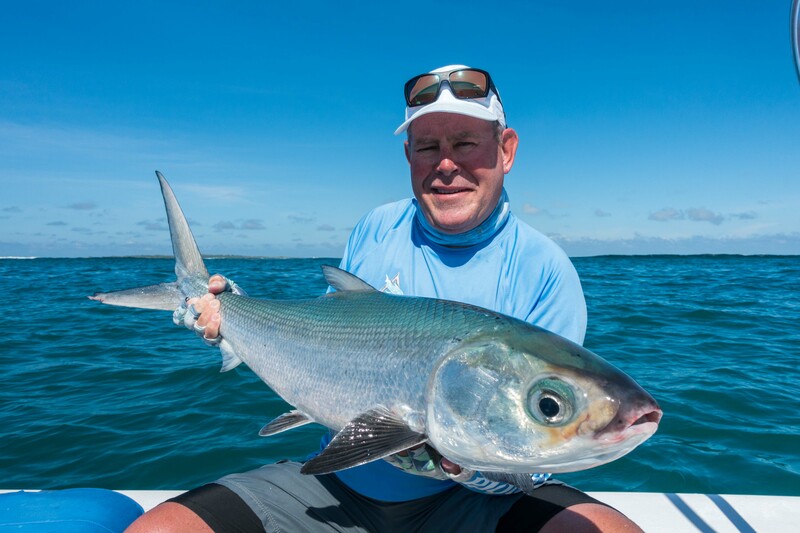 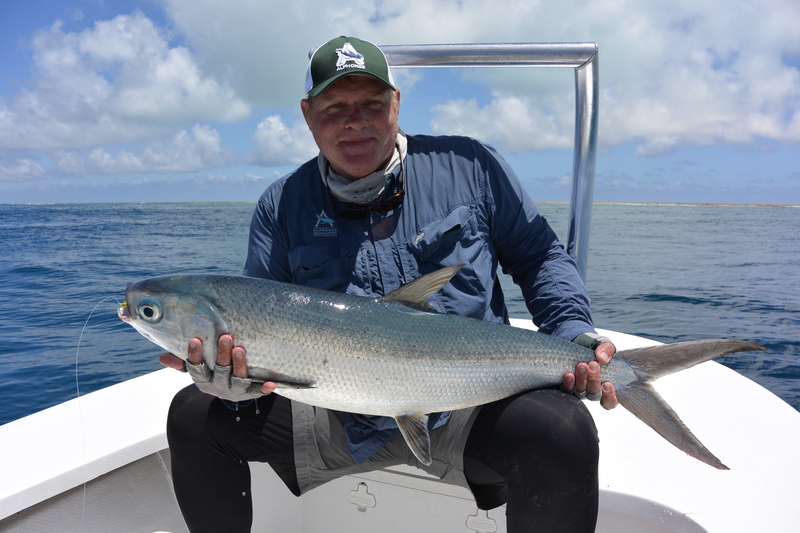 Matt ferry landed two Milkfish with the largest measuring in at 95cm. 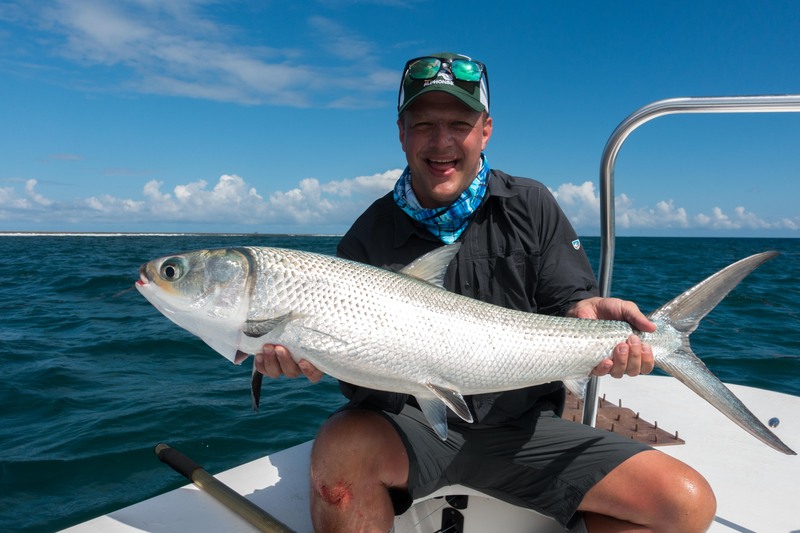 After being dragged a few miles offshore during a one and a half hour flight Ross Elliot managed to land the first of his two milks with the fish measuring 98cm. 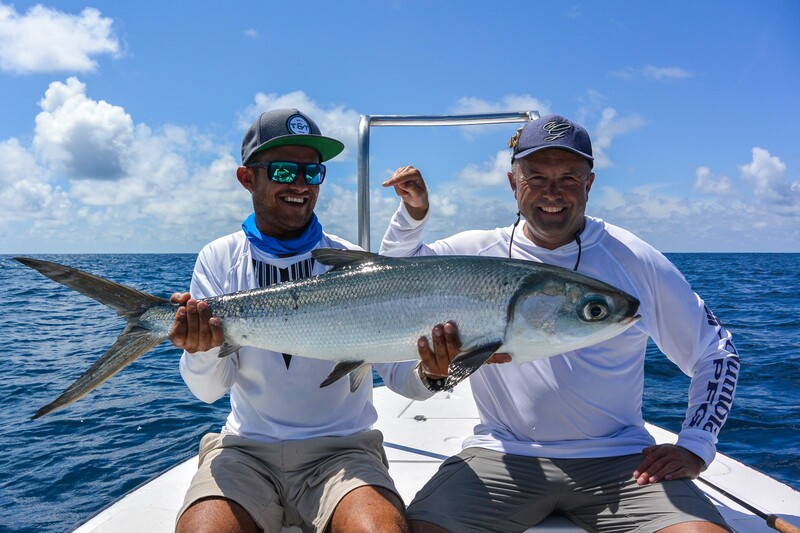 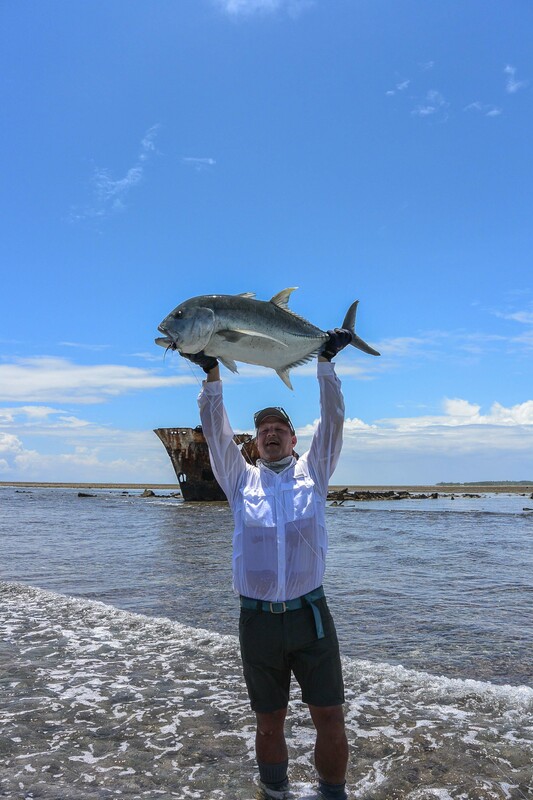 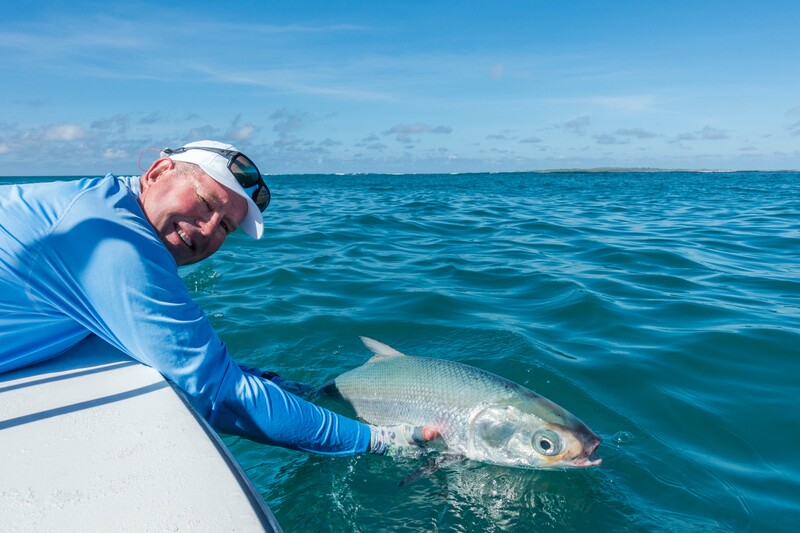 Tim Hammond, Bob Skinstad and Jonathan Stott landed a fish each, while Ray Cadiz completed a brace of Milkfish in one day. 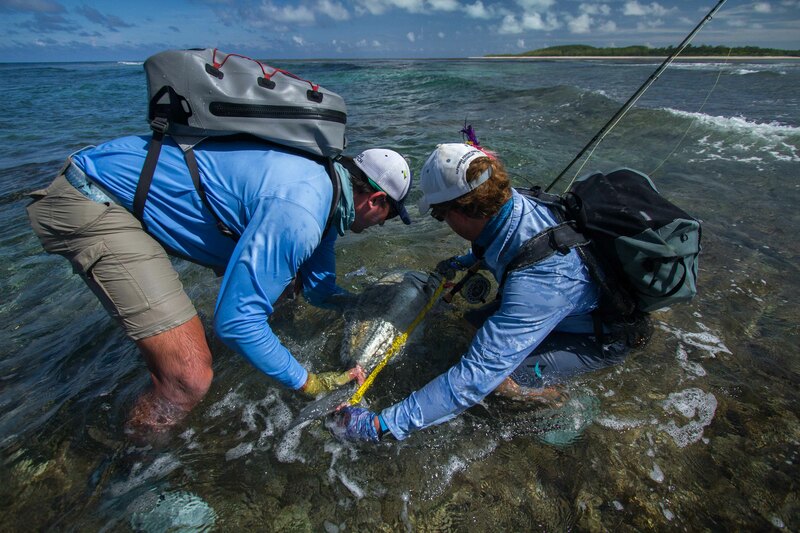 The Alphonse Fishing co. representatives, Devan Van der Merwe and Keith Rose-Innes couldn’t believe their luck. 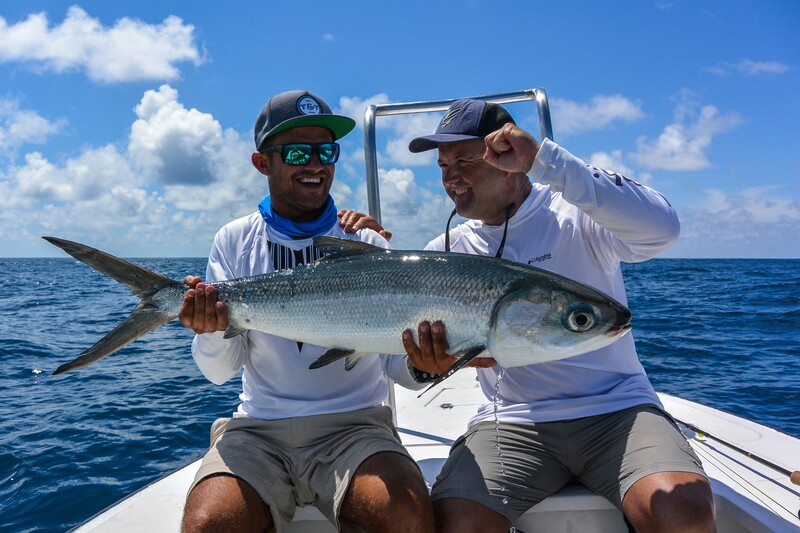 Devan finished his week off with four Milkfish comprising of two fish on two consecutive days, whilst Keith topped out at six Milkfish, with four in one day and the largest measuring at 102cm, which won him the Milkfish honors. 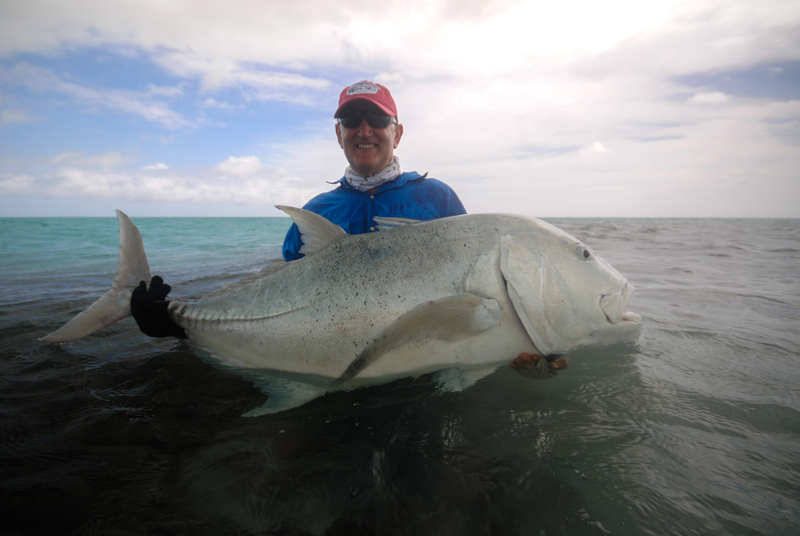 The ‘tricky triggers’ were in play with equal results in numbers and size. 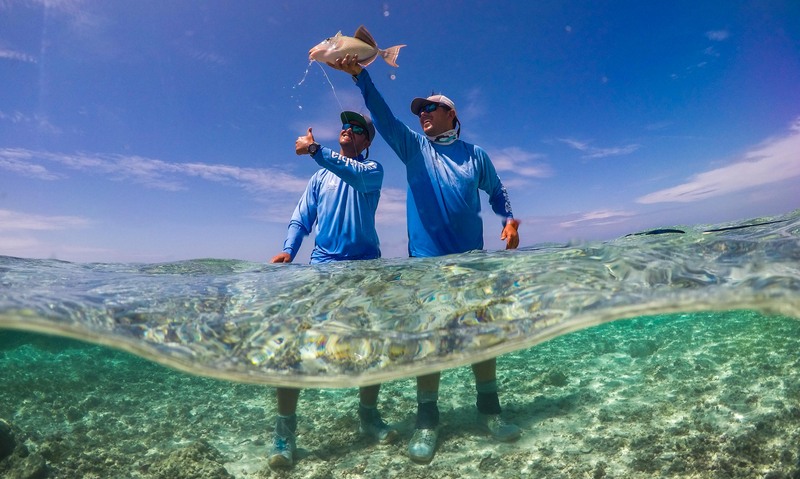 Four Moustache Triggerfish were landed between Bob, Tim, Justin and Jonathan Stott, who walked away with the prize for a 54cm trophy fish. 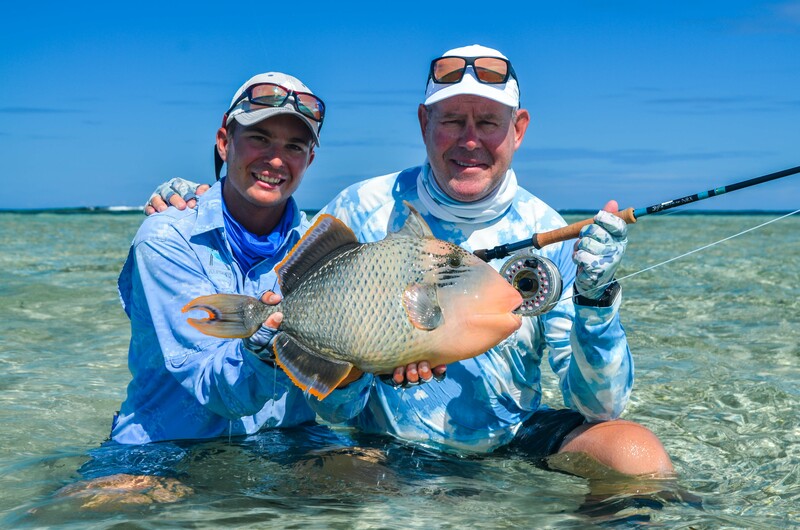 The Yellowmargin Triggerfish played an equal game with a total of four landed between Justin, Devan, Murray and Andrew, who caught a specimen measuring 54cm winning him the prize for the longest Yellowmargin Triggerfish. 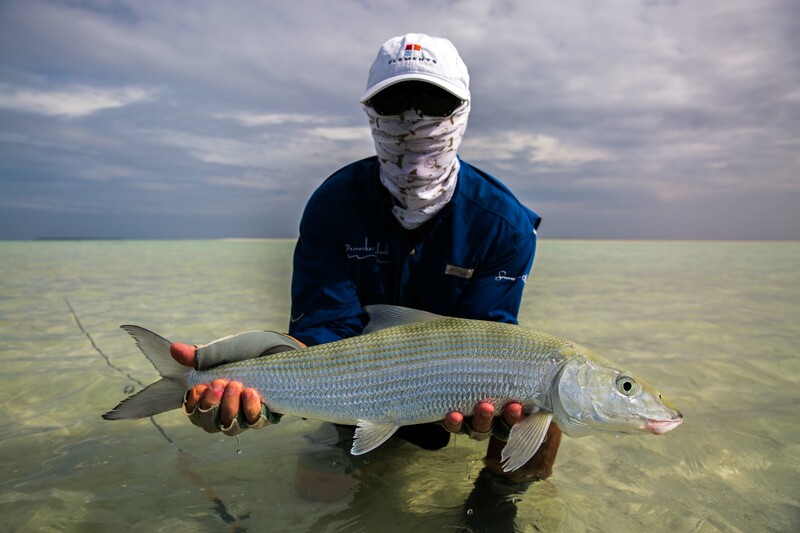 Going into the last day Andrew Church held three of the top five spots only to have his boat partner Tim Hammond steal a spot away from him in injury time with a very nice 66cm Bonefish. 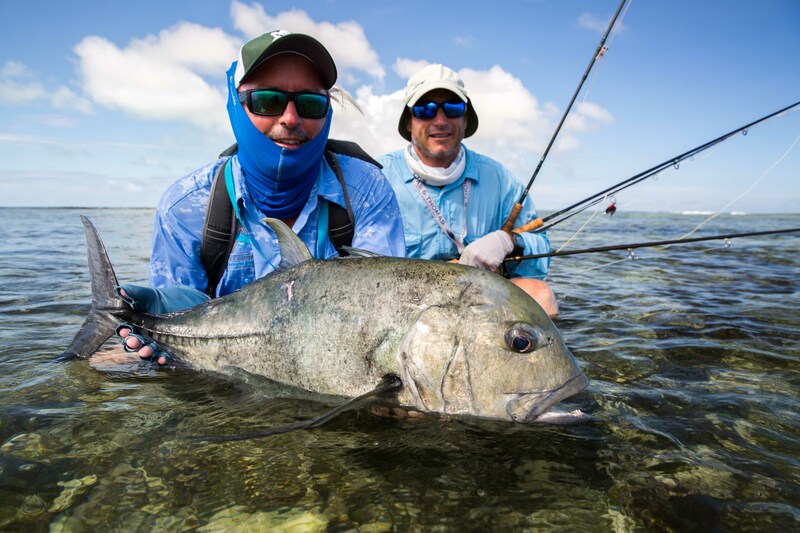 The bluewater fishing was exceptional this week. 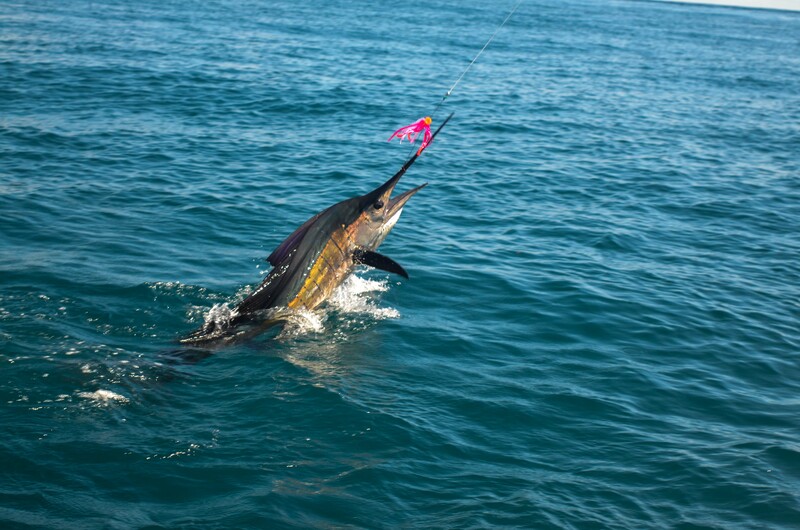 The sailfish unfortunately, didn’t play ball on fly but Chris, Lemmer and Stephan all had the time of their lives fishing for tuna and a vast array of different species. 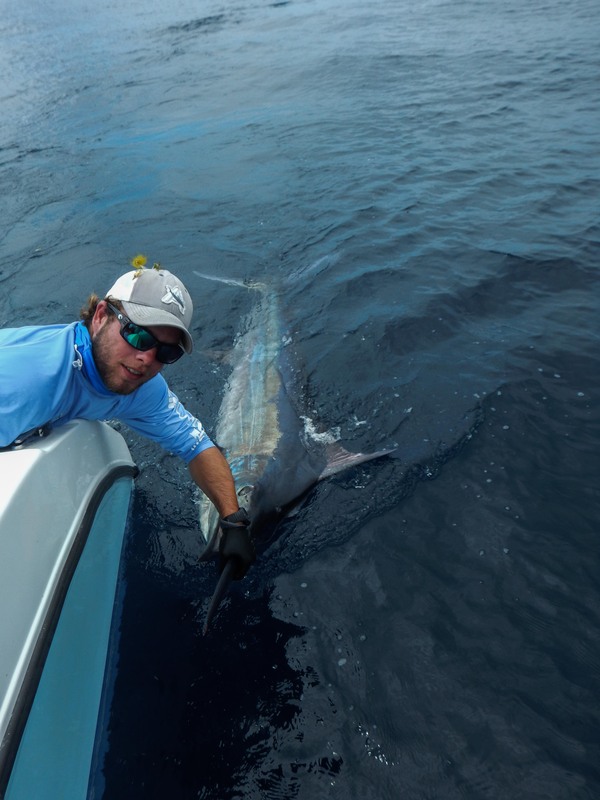 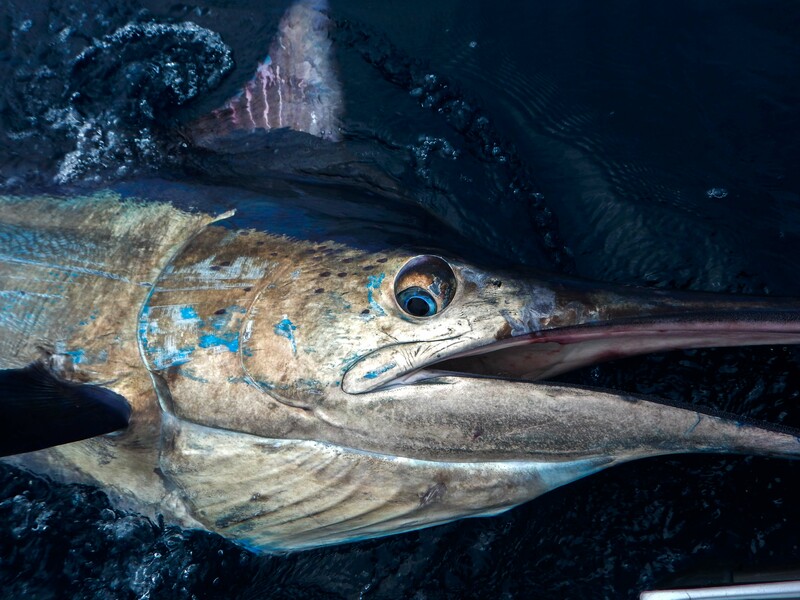 One of the most notable catches on the bluewater boat was Stefan Terblanche’s gorgeous 100kg black marlin. 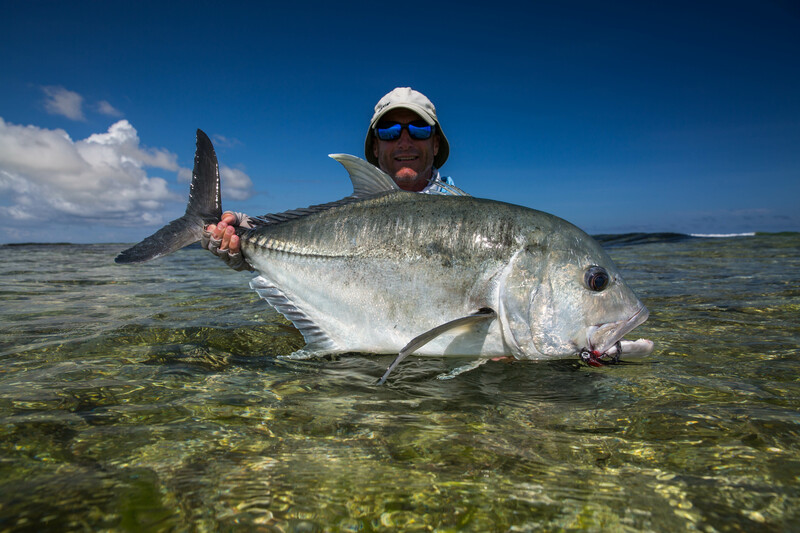 We don’t see these fish often so it makes it even more special on a week like this. 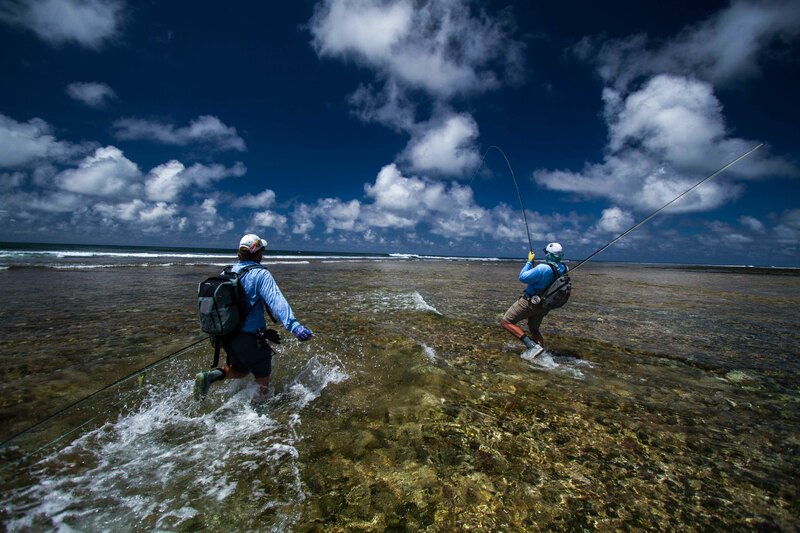 As the competition drew to a close this is how the leaderboard looked. 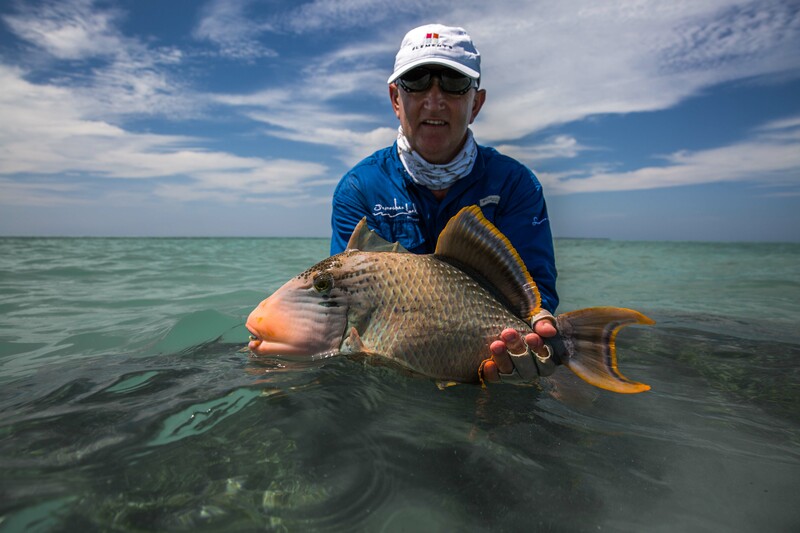 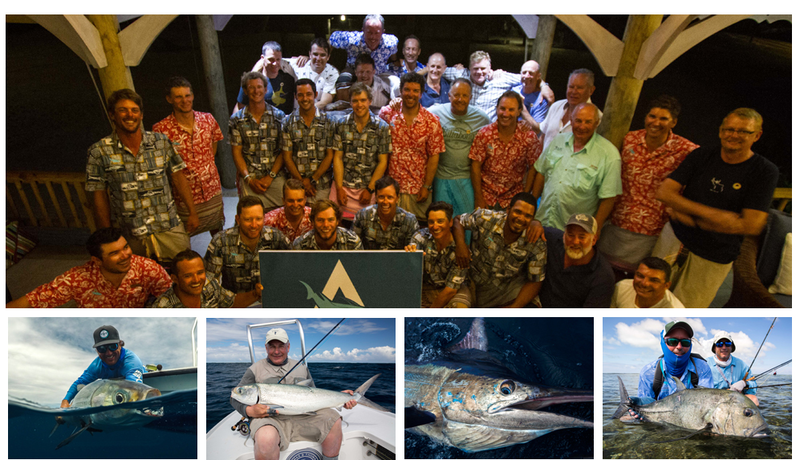 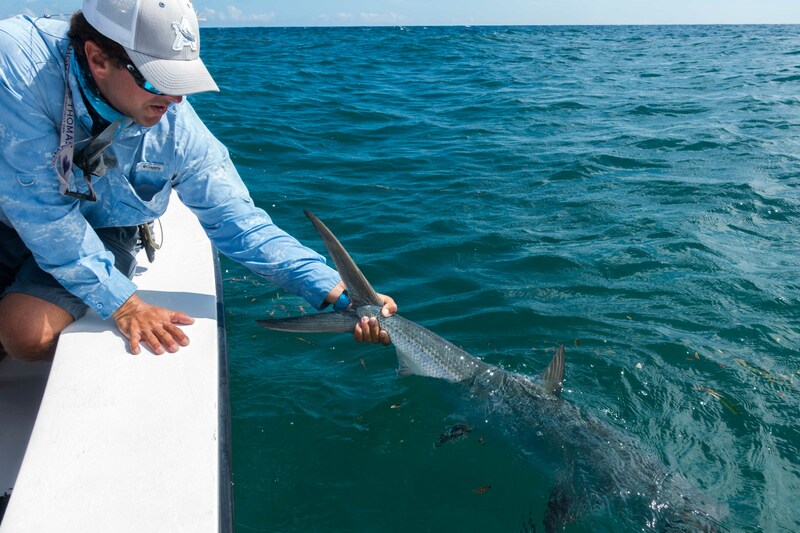 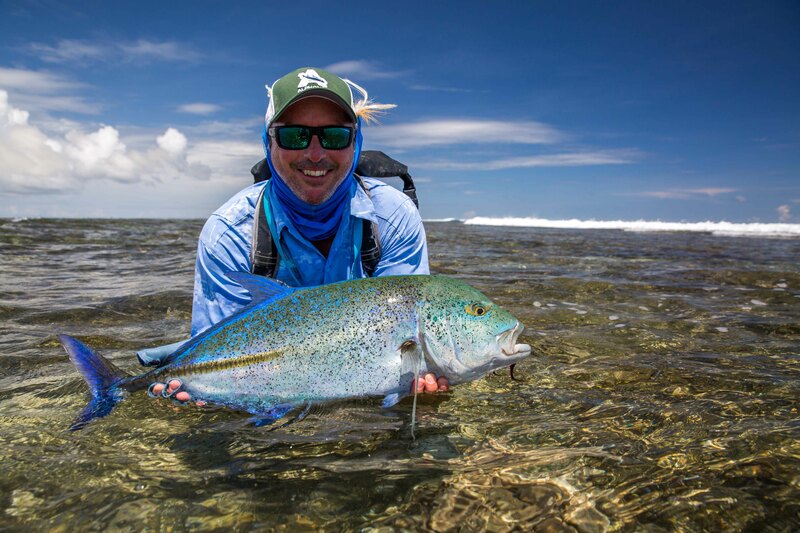 On behalf of the entire Alphonse team, we would like to congratulate all our anglers on an incredible weeks fishing. 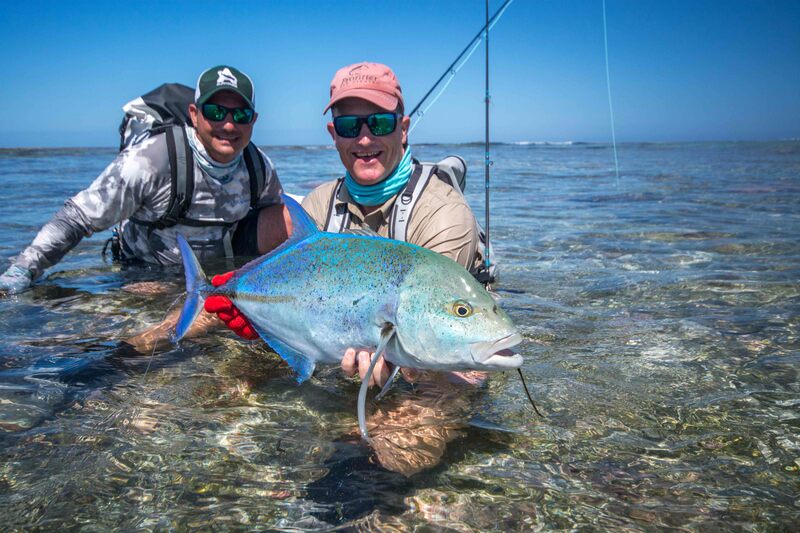 To the guys that took the prizes home, well done and we hope to see your new rods, lines and reels in action the next time you are out here.